Helping locals for over 17 years. Louisville chiropractor & Lafayette chiropractor. Dr. Jason is in his 17th year of practice working as a Lafayette and Louisville Chiropractor. He received his degree from Parker Chiropractic College in Irving, Texas and completed his internship at the Parker Alpha Clinic. His undergraduate work was done in Portland, Oregon. Dr. Jason was born and raised in Carbondale, Colorado. He served in the Coast Guard for four and a half years, prior to receiving his formal education. In the year 2000, Dr. Leach traveled to Brazil for four weeks to treat patients in hospitals and clinics. Some of his fondest memories are of helping those less fortunate people who were in dire need of chiropractic care. 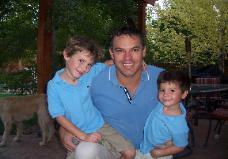 He resides in Lafayette, Colorado and is a proud husband and father of two active boys. Patients come to see Dr. Jason and his family friendly staff from all over. Dr. Jason is passionate about helping you feel better so you can live your best life! Our practice utilizes the most advanced diagnostic technology available in order to accurately assess your concerns. Contact us today and see if this technological breakthrough is your answer. "I was having continuous pain in my lower back and hips, and was diagnosed with a herniated disc. It was painful to sit, stand, and especially sleep. Rolling over during the night would wake me up from a sound sleep. Driving was difficult. Since being treated with non-surgical spinal decompression, I’m virtually pain free all of the time. I’m sleeping soundly and standing all day to teach, pain free! The spinal decompression has been a miracle for my life. I’m feeling better and I believe all my organs are working better because my spine is not in trauma." "I was having constant back and leg cramping. I was tired of living on pills. I was limited on my daily activities due to this. Since being treated on the Decompression my back and legs feel good. I get a good night sleep, and am no longer limited on my activities. I recommend this treatment for anyone living with back and leg pain. You are not going to meet any nicer people then here."